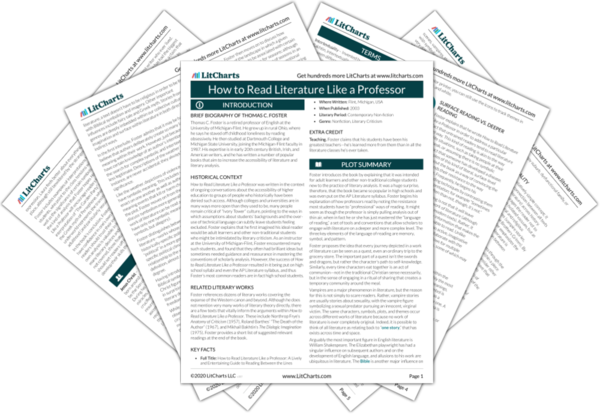 Instant downloads of all 946 LitChart PDFs (including How to Read Literature Like a Professor). 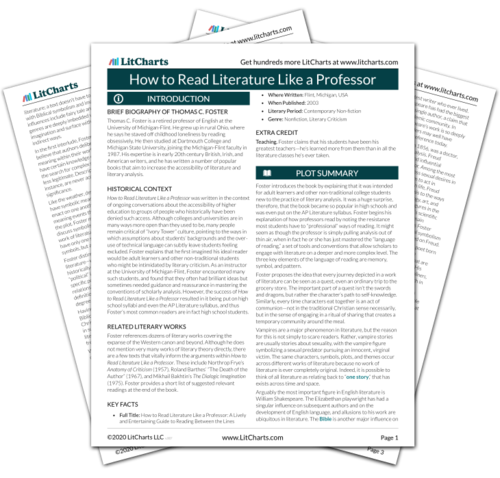 Welcome to the LitCharts study guide on Thomas C. Foster's How to Read Literature Like a Professor. Created by the original team behind SparkNotes, LitCharts are the world's best literature guides. A concise biography of Thomas C. Foster plus historical and literary context for How to Read Literature Like a Professor. A quick-reference summary: How to Read Literature Like a Professor on a single page. In-depth summary and analysis of every Chapter of How to Read Literature Like a Professor. Visual theme-tracking, too. Explanations, analysis, and visualizations of How to Read Literature Like a Professor's themes. How to Read Literature Like a Professor's important quotes, sortable by theme, character, or Chapter. Description, analysis, and timelines for How to Read Literature Like a Professor's characters. Description, analysis, and timelines for How to Read Literature Like a Professor's terms. Explanations of How to Read Literature Like a Professor's symbols, and tracking of where they appear. An interactive data visualization of How to Read Literature Like a Professor's plot and themes. Thomas C. Foster is a retired professor of English at the University of Michigan-Flint. He grew up in rural Ohio, where he says he staved off childhood loneliness by reading obsessively. He then studied at Dartmouth College and Michigan State University, joining the Michigan-Flint faculty in 1987. His expertise is in early 20th century British, Irish, and American writers, and he has written a number of popular books that aim to increase the accessibility of literature and literary analysis. 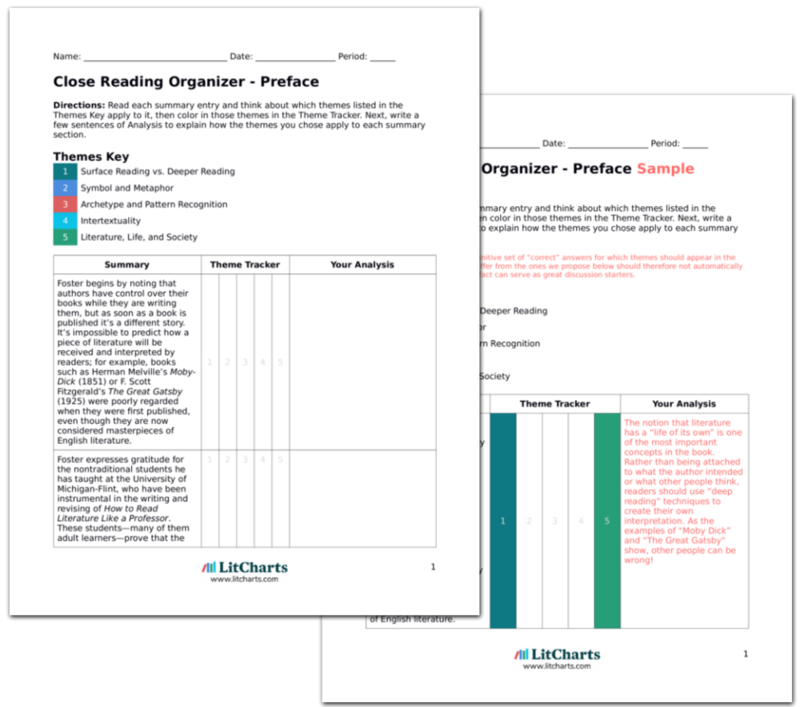 Get the entire Read Like a Professor LitChart as a printable PDF. How to Read Literature Like a Professor was written in the context of ongoing conversations about the accessibility of higher education to groups of people who historically have been denied such access. Although colleges and universities are in many ways more open than they used to be, many people remain critical of “Ivory Tower” culture, pointing to the ways in which assumptions about students’ backgrounds and the over-use of technical language can subtly leave students feeling excluded. Foster explains that he first imagined his ideal reader would be adult learners and other non-traditional students who might be intimidated by literary criticism. As an instructor at the University of Michigan-Flint, Foster encountered many such students, and found that they often had brilliant ideas but sometimes needed guidance and reassurance in mastering the conventions of scholarly analysis. However, the success of How to Read Literature Like a Professor resulted in it being put on high school syllabi and even the AP Literature syllabus, and thus Foster’s most common readers are in fact high school students. Foster references dozens of literary works covering the expanse of the Western canon and beyond. Although he does not mention very many works of literary theory directly, there are a few texts that vitally inform the arguments within How to Read Literature Like a Professor. These include Northrop Frye’s Anatomy of Criticism (1957), Roland Barthes’ “The Death of the Author” (1967), and Mikhail Bakhtin’s The Dialogic Imagination (1975). Foster provides a short list of suggested relevant readings at the end of the book. Teaching. Foster claims that his students have been his greatest teachers—he’s learned more from them than in all the literature classes he’s ever taken. Seresin, Indiana. "How to Read Literature Like a Professor." LitCharts. LitCharts LLC, 19 Jun 2017. Web. 24 Apr 2019. Seresin, Indiana. "How to Read Literature Like a Professor." LitCharts LLC, June 19, 2017. Retrieved April 24, 2019. https://www.litcharts.com/lit/how-to-read-literature-like-a-professor.